In a move that can only spell the end of all things, CBS is turning some dude’s Twitter account into a sitcom. I’ve read @shitmydadsays and it’s genuinely funny, but it works because of how it’s presented. Short snippets of abusive wisdom culled from the word-vomit of a crotchety, doddering old man. Anything charming or humorous about @dadsshittysayings will certainly be lost in translation if it ever makes it to TV. I’m not kidding when I say this news does not bode well for humanity. When twitter accounts become TV, how far away can “Status Update: Ben is washing his gym clothes – The Movie” be? Is that a man with the head of an oxe standing on a raft hewn from the bones of the stillborn in a river of liquid damnation? I think it is, and I think he’s just waiting for a few more Twitter-based TV shows before he unleashes his unholy army of winged goats. In the end it will be called “That’s Our Dad,” and star pretty much everyone from “Everybody Loves Raymond” except for the titular Mr. Romano. See? Armageddon. Read up on it HERE, and come see me! I will be doing a couple of panels about webcomicing and I expect you to have your questions prepared on 3X5″ note cards. I’ve explained that sketched books are taking longer than expected because I don’t want to give everyone the same rehashed 30 second character face, but I want you to see what to expect when you order an Artist Edition. Check out some of the recent book sketches HERE in my twitpic stream. I’ll be posting them all to Flickr when I’m done. Are you interested in “I’m A Snowflake on The Wind” holiday cards? Are you interested in giant sized “Snowflake” comic prints? Those are likely the next two things to be added to the store in the next few days. Extol your interest in the comments. Posted in Uncategorized and tagged cbs, social networking, tv, twitter. I don't know what's worse: @shitmydadsays becoming a TV show, or the man behind the @HOBODARKSEID curtain being revealed as Matt Fraction via NPR's blog. I actually kind of feel bad for this guy, because he probably knows in his heart that it's a terrible idea to try to turn this into a sitcom, but how can you turn down an offer to produce and write your own TV series? i dont blame the guy at all. I would totally do it to. The shows just going to be terrible though. Hes also got a book deal out of it. Wow…Hollywood IS desperate for ideas. What, like "Bushisms"? Only fewer people will care? Texts From Last Night is a train wreck. A beautiful, magnificent train wreck. Joel, sorry to say it, but josh had the funniest lines in todays comic. But it doesn't sound like the Twitter accounts you guys just made up will be that much fun to read, except @shitmydadshomeputyourpantonandjumpoutthewindow. just sayin'. My $64K question is how they can stretch that stuff out into 22 minutes (w/o commercials) and no harsh cursing. I'd leave the swear words to keep at bay the scary ox-head man on the bone-raft and his hordes of flying goats. so very far from first, lou. I always give Josh the best lines. Thats what he's for. I imagine it will be essentially a sitcom and the only difference will be a handful of "one liners" they put in. I'm glad you folks agree with me on this one, horrible idea. It's just All In The Family or Sanford and Son all over again. My main reaction to this Twitter feed, which I read as an RSS feed since I no longer actually use Twitter, is "Dude, move out, move out now!!" I always find it ironic when you hear about stuff like this. There have been good original tv sitcoms but they get canceled. Titus comes to mind….that show was brilliant and different and it got shitcanned. I know this has already been said, but they cancel Dollhouse for this crap? Does anyone else remember the first episode of Family Guy after the involuntary "hiatus" when Peter Griffin listed every show that Fox greenlight then canceled between the end of season 3 and beginning of season 4? I remember that, and at least half the shows were some of my favorites ever. Firefly & Wonderfalls come to mind. "Of course, if all those other shows go down the tubes, we may have a shot." Ah! Dark Angel! I always forget about that one. I love that show. "You worry too much. Eat some bacon… What? No, I got no idea if it'll make you feel better, I just made too much bacon."……. Josh should look into getting adopted by that man. And yet they still cancel Dollhouse? Chewbacca is a Wookiee from the planet Kashyyyk….. I love the "Chewbacca" defense. "Ladies and Gentlemen of this supposed jury, this does NOT MAKE SENSE!!!" If they are going to make a show out of a twitter feed, it should be @DRUNKHULK. "Is that a man with the head of an oxe standing on a raft hewn from the bones of the stillborn in a river of liquid damnation?" This is why I love you, Joel. Incidentally, did you hear the Evil Fox Executive has struck again? At this point, wouldn't it be easier for Joss Whedon to just show up at the Fox lot every day and just get dickslapped for eight hours? In the long run, I think it would be less painful for Joss and his fans. :oD That is the funniest thing I've heard said about the cancellation. On that note – LOLFOX has givn u a tshrt sale Joel. I said if they did it I would have to get one, so no point wasting time! Although now I come to think of it, the only people who will get it are people who watch US TV on US TV schedules *by magic!!! * but that has never stopped me before, so T-shirt it is! I think they already made that show. It was called "Titus"
…and they already made my comment (above). Joke repeat fail. I am glad to be not the only person who remembers that show. I will absolutely buy snowflake Christmas cards simply for the benefit of the 4 people I know that will get the joke. With the current run of sitcoms on CBS (the only sitcoms left in existence, perhaps?) half the scripts for all of them might as well have come from @thatswhatshesaid. I had a friend back in college who flat out refused to watch any of the CBS sitcoms because they had laugh tracks. Despite the "that's what she said" mentality, I think they're fairly well crafted comedies. But YES for snowflake in the wind cards! Yes on cards and prints!!! 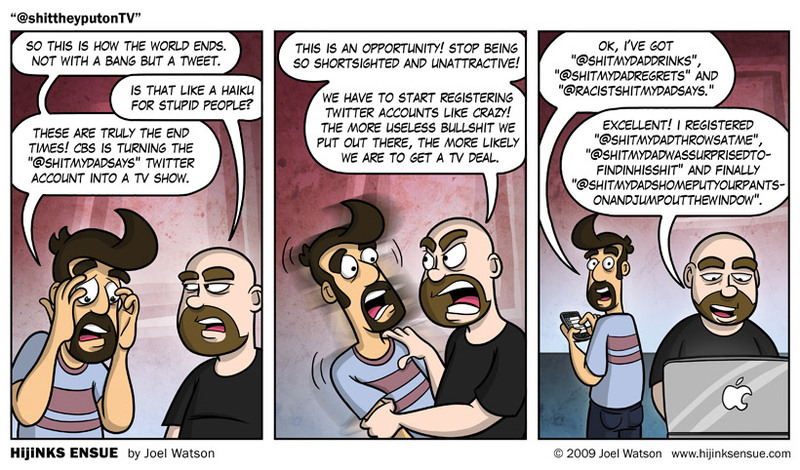 "… Not with a bang, but with a tweet" made me laugh really hard. I've been sitting in my office giggling all day, and my coworkers are starting to get scared. Excellent work, Joel, as always! I would buy Snowflake cards and send them to every one I know. Most of them wouldn't get it, but who cares. I have a regular-sized print already, but I would love a giant one! Yes, Snowflake. Yes. I will buy. Also, I LOVE Josh in this. If real life Josh is like that I want him for a friend. how big we talking on the giant print? SIGN ME UP! and the cards would probably look awesome! 11X14 or 17 depending on what looks best. I would… probably buy a snowflake on the wind card. Or three. Who am I kidding? Also, what is this comment system and how do I change my picture? XD I had forgotten that it's that thing… that recognizes your email address… that I used to use back when I posted many comments on Harry Potter things. "…star pretty much everyone from “Everybody Loves Raymond” except for the titular Mr. Romano." Wasn't that already a show? Memory serves as Ray's friend or brother or whoever having a show. If you sell those Snowflake cards in packs of ten or twelve, I will totally send them to everyone this year. Doooo iiiiiit! Anyone else notice this is a pretty josh centric week or so that we've been having? I get in "joshy" moods sometimes. I'f you had only known who the dad would be at the time….. It was actually a book first…. and it’s not a bad show. Shatner.